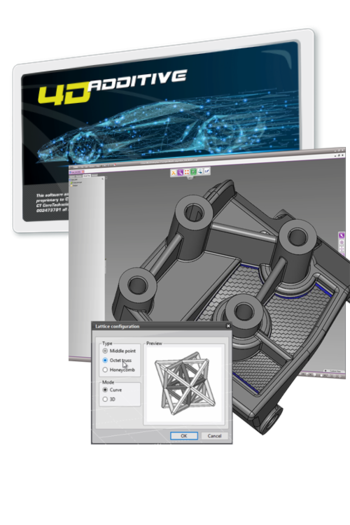 ASCHAFFENBURG, Germany, Jan 18, 2019 – In order to cope with the fast development of additive manufacturing and a higher accuracy needed for the production of small series, CoreTechnologie is pleased to introduce its new, powerful software suite 4D_Additive. The unique feature of 4D_Additive is that CAD data of all current systems are read by precise native interfaces and processed as exact B-Rep geometry also including all product manufacturing information (PMI). 4D_Additive makes it possible to analyze, repair and prepare the 3D models with the highest precision and according to CAD engineering standards. With conventional 3D printing software, CAD models are usually triangulated, i.e. converted to STL already in the reading process, which makes it technically impossible to handle or repair the geometry without deviating its original shape. In comparison, 4D_Additive avoids such deviations because of its exact geometry kernel and the fact that CAD models remain in their original mathematical description until the end of the process. In the final slicing step, depending on the machine type, also exact vector graphics can be generated. These exact curves can be processed directly as straight lines, circles and arcs. 4D_Additive reads native CATIA, NX, SOLIDWORKS, CREO, INVENTOR as well as IGES, STEP and JT files. To save the data the software also supports 3MF, AMF STL and all major slicing formats. The new software has a modern easy-to-use user interface and innovative features such as automatic 3D nesting as well as a collision check and distance control for automated and safe placement of the parts in the building space. The dynamic roughness analysis enables the user to determine the optimal alignment of the part within seconds in order to achieve the best possible surface quality, shortest manufacturing time or lowest costs. The tool also comprises an automatic support geometry generation needed e.g. for FDM or metal laser sintering. The know-how database of the system contains settings for all major machine types and related information about the additive manufacturing method so that important parameters are preset when the user selects a machine. Also, the module for texture generation is easy to use and based on the exact geometry which allows for the precise definition of the texture also on the transitions of the faces. More than 5,000 predefined textures are available for the system. Particularly in connection with high-resolution processes such as HP JetFusion, impressive parts are being produced. CoreTechnologie is the leading global software provider in the 3D CAD interoperability market for 3D CAD data conversion. Since its foundation in 1998, CoreTechnologie consistently presents innovative developments and has shown an outstanding performance with a yearly growth rate of 20%. The 3D_Evolution software suite is the first choice of more than 500 leading technology companies that are developing complex products in the automotive, aerospace, mechanical engineering and consumer goods industry. In a global marketplace with very few providers for collaboration software, CoreTechnologie considers R&D as a crucial part of its business and continuously reinvests 35% of its revenues in the development of new products and technologies. For more information, visit https://www.coretechnologie.com.